The season has been long and Cristiano Ronaldo is certainly one of those players who will need to recharge his batteries to approach the new challenges of a highly anticipated campaign in 2012/13. The Real Madrid star went to Saint Tropez with his girlfriend Irina Shayk as well as his son Cristiano Ronaldo Jr and from what we can tell from several photos that have been released, he's surely enjoying his deserved vacations! 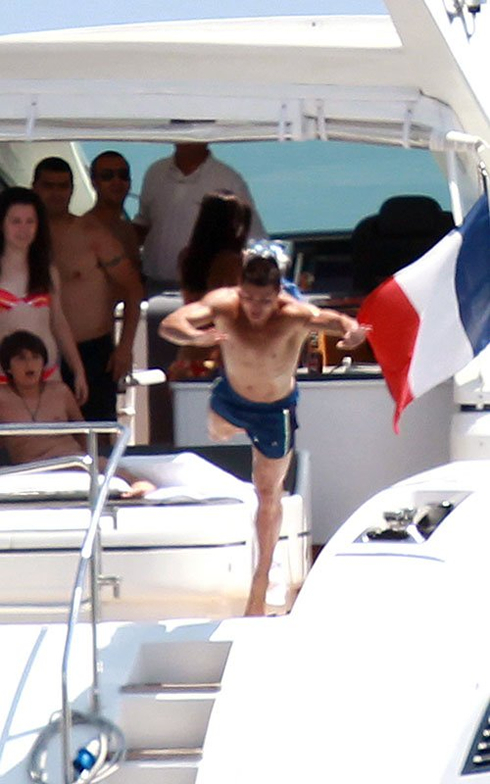 With the EURO 2012 already on the rear mirror, Cristiano Ronaldo has gone on vacations with his girlfriend Irina Shayk and the destination the couple picked was the glamorous Saint Tropez, in the French Riviera. However, the Russian beauty isn't the only person making Ronaldo happy these days, as the Portuguese superstar is also enjoying the opportunity to spend some time with his 2-years old son, Cristiano Ronaldo Jr. (also known as "Cristianito"). Contrary to many recent rumors, Ronaldo seems happier than ever with Irina Shayk and the Russian model definitely looks more and more attached with the little "Cristianito". Over the last years, Ronaldo has dated several women and those who are used to follow every step the Portuguese star gives, already know his preferences for sunny destinations when going on vacations with his girlfriends. This year and just a few days after a dramatic exit at the EURO 2012, Ronaldo hand picked Saint Tropez to revitalize himself and prepare for the tough battles that the new season holds for him. Real Madrid returns to training on the 15th of July, but since Cristiano Ronaldo has been competing in the EURO 2012 until the 27th of June, he's expected to join his teammates only a few days later. A similar situation will happen to the Spanish National Team player from Real Madrid, who were only dismissed from duty on the 1st of July. Having that in mind, it's no surprise to see Ronaldo trying to make the most out of these "days off", as we will all start seeing him in action in just a few weeks from now. Regarding Cristiano Ronaldo's personal life, it seems safe to say now that the Portuguese has found his most stable girlfriend so far and that all those rumors pointing to a possible break-up are gone and buried. Even though it doesn't appear to be likely that a wedding could take place this Summer, Ronaldo and Irina Shayk have been showing a great chemistry together and the couple's photos playing with each other in Saint Tropez, can make us believe that this relationship still has legs to walk and endure. Real Madrid's season is now over and there are no games left in their schedule until the pre-seasons starts by July. Cristiano Ronaldo has left the Portuguese Team camp in Poland and Ukraine, after being eliminated from the EURO 2012 and is now enjoying his vacations in Saint Tropez. Cristiano Ronaldo next game will probably be in Moghreb Tetouan vs Real Madrid, which you can watch from our football live streams section.